With a suitcase full of Jane Austen novels en espanol, Amy Elizabeth Smith set off on a yearlong Latin American adventure: a traveling book club with Jane. In six unique, unforgettable countries, she gathered book-loving new friends-- taxi drivers and teachers, poets and politicians-- to read Emma, Sense and Sensibility, and Pride and Prejudice. Whether sharing rooster beer with Guatemalans, joining the crowd at a Mexican boxing match, feeding a horde of tame iguanas with Ecuadorean children, or tangling with argumentative booksellers in Argentina, Amy came to learn what Austen knew all along: that we're not always speaking the same language-- even when we're speaking the same language. But with true Austen instinct, she could recognize when, unexpectedly, she'd found her own Senor Darcy. 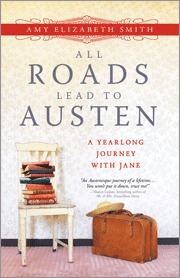 Amy Elizabeth Smith crosses borders and languages with her non-fiction travel novel, All Roads Lead to Austen: A Year Long Journey with Jane, trying to find how Austen translates in different cultures. The book is a little slow when it comes to action and event but the in-depth study of Jane Austen and how her book translates is worth the reading. I love that Austen translates across culture better than I would have thought. Even better than Smith herself thought! The men and women of South American countries loved Austen for various reasons and all had their own insights into her novels. Though only Pride and Prejudice, Emma, and Sense and Sensibility were studied. I wish the year that Smith traveled would have been long enough to include her other novels, but I shouldn't be "Woe is me!" after finishing a book that even stays true to Austen's novel endings. I would highly recommend this book for anyone who has read Jane Austen. The book creates a sense of bonding between unmet readers across the world upon the fact that Austen's work is universal, touching every life that reads her. I am reading this book right now and am enjoying it, even though I'm not an Austen fan. I recommend it.